He took the 50,000-pound ($87,000-dollar) prize for a book described by the chairman of the judges as revealing “the dark side of India” at the glittering ceremony in London’s Guildhall. Arvind Adiga was the youngest among the six short listed for this award. He said his book – the story of Balram Halwai, a village boy who becomes an entrepreneur through villainous means – aimed to highlight the needs of India’s poor. Aravind Adiga was born in Chennai in 1974 to K. Madhava and Usha Adiga. He grew up in Mangalore and studied at Canara High School, then at St. Aloysius High School, where he completed his SSLC in 1990. He secured first rank in the state in SSLC. After immigrating to Sydney, Australia, with his family, he studied at James Ruse Agricultural High School. He studied English literature at Columbia College, Columbia University in New York, where he graduated as salutatorian in 1997. He also studied at Magdalen College, Oxford. After finishing his studies, Adiga began his journalistic career as a financial journalist, interning at the Financial Times. With pieces published in the Financial Times, Money and the Wall Street Journal, he covered the stock market and investment and interviewing. He was subsequently hired by TIME, where he remained a South Asia correspondent for three years before going freelance. 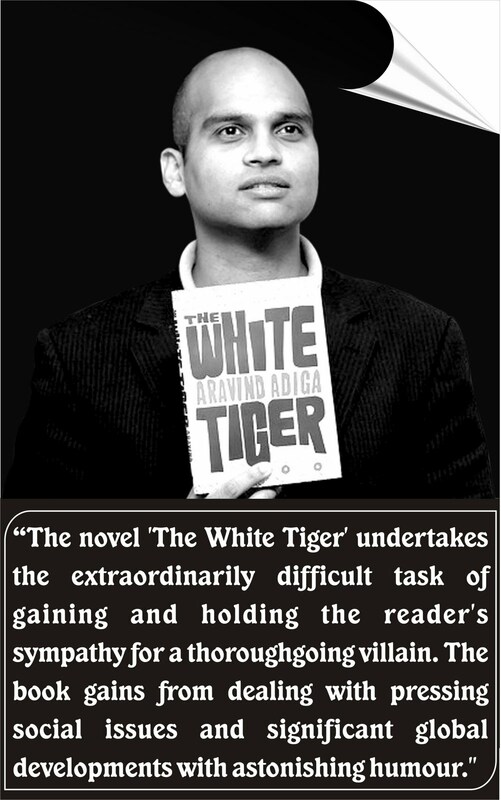 During his freelance period, he wrote The White Tiger. The master-servant equation provides fodder for Arvind Adiga’s fiction, The White Tiger .The central character of the novel, Balram is a true warrior who rises from lowly villager to become a chauffeur and then breaks all rules to become a fearless entrepreneur. The plot is presented through a series of letters written over a period of seven nights, through Balram Halwai, born in a small village in northern India, his parents couldn’t even be bothered to give him a name, just calling him ‘munna’. His smartness was recognized by the school inspector who praised him as a ‘white tiger’, “the rarest of animals, the creature that only comes along once in a generation”. Also, he promises to arrange a scholarship for him but the family take him out of school and puts him to work at a tea shop. Balram slowly manages to distance himself from his family. He learns driving and considering this as an opportunity to escape he becomes driver of Ashik and his wife who eventually brought him to Delhi. The novel should make an interesting reading for people who like to understand the underlying complexity behind the calm of everyday life around us. The book presents a class struggle between India’s wealthy and the poor. Adiga’s second book, Between the Assassinations, was released in India on 1November 2008. The book features 12 short stories. The stories dramatize a range of responses from resigned acceptance to, even complicity with, the established order, to seething impotence and maddening rage. Some of the stories, particularly those in the first half of the book, work very well because of the depth of Adiga’s characterization of both person and place (and Kittur is the real protagonist of his work). Adiga’s grasp of the contours of the world he is mapping seems much surer here than in The White Tiger, which posited a facile binary vision of “the Light” and “the Darkness” in 21st century India. An attractive feature of his work is the verbal tics he gives to his characters, as if to suggest that where human relations are out of joint, language too must always keep fumbling for meaning.